Licensed Providers are licensed and authorized by WMTC to sponsor thier own courses and contract directly with sponsors. Affiliate Providers are colleges and universities that offer credit for WMTC courses. A climber, backpacker, and paddler, Zac is the executive director of the National Center for Outdoor & Adventure Education. NCOAE is a WMTC Licensed Provider. A climber, mountaineer, skier, rafter, and mountain biker, Aaron owns Southwest Rescue where he sponsors and teaches WMTC wilderness medicine courses and Rescue 3 International swiftwater rescue courses. Aaron also works year round for San Juan Mountain Guides where he guides rock climbing, alpine mountaineering, and backcountry skiing trips and teaches Level 1 and Level 2 avalanche courses. Aaron is an American Institute for Avalanche Research and Education instructor trainer, an adjunct faculty member for Fort Lewis College, and a member of the La Plata County Search and Rescue team. Jonathan Cooper is an avid backcountry splitboarder, climber, and mountaineer. He spends his winters teaching avalanche courses for the American Institute for Avalanche Research and Education in the Pacific Northwest and Southwest Colorado. When he is not teaching wilderness medicine for WMTC, he can be found chasing alpine rock and good skiing throughout the year. 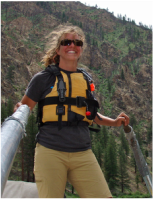 A climber, skier, canyoneer, rafter, and mountain biker, Alexis works as a River Guide for Mountain Travel Sobek and in the Salmon, ID emergency department when not teaching for WMTC. When not working or on a personal trip Alexis spends her time fly fishing and in one of Idaho's many super secret hot springs. A climber, caver, and backpacker, Jerome is Assistant Professor in the Department of Recreation, Sport and Tourism Management at the University of St. Francis. Prior to working for the university Jerome directed the outdoor program at Bowling Green State University and a professional climbing, caving, and backpacking guide for Vertical Ventures in British Columbia, Canada. A climber, mountaineer, paddler, and backpacker, Garrett works for the University of Wyoming Outdoor Program. A paddler, canyoneer, and world explorer, Larry spends his time doing locums work at Emergency Departments throughout the country, instructing NOLS and Outward Bound courses, and taking personal wilderness trips. Every now and again you can find Larry playing his guitar and singing around a remote campfire with friends. A paddler, climber and skier, Teddi works for the Northwest Outward Bound School and the Athenian School. When not working or playing in the backcountry, she enjoys drinking coffee and watching the birds. A skier, climber, and mountaineer. Cam works as an Avalanche Mitigation Technician out of Salt Lake City Utah during the winter. Along with this he is a member of Wasatch Backcountry Rescue. During the summer he guides for Alaska Alpine Adventures as well as an Instructor for the Northwest Outward Bound School in Washington. A rafter, caver, and mountain biker, Leah is the Program Coordinator for EPIC Adventures at Eastern Washington University. She has worked as a professional rafting, caving, and mountain biking guide and as a field instructor for youth-at-risk programs. Eastern Washington University is a WMTC Affiliate Provider. A climber, mountaineer, paddler, and canyoneer, Scott is a Wilderness Education Association instructor trainer and academic faculty for the Outdoor Recreation Leadership and Management Program at Northern Michigan University; NMU is an WMTC Affiliate Provider. He is also an accomplished storyteller and musician. A climber, mountaineer, mountain biker, and whitewater kayakar, Aaron teaches swiftwater rescue courses when not working for WMTC. In a past life, Aaron taught technical rescue, pre-hospital medicine, and outdoor education at Union College, in Lincoln NE where he was the coordinator for the college's Disaster Response Team (DiRT). DiRT has provided aid during hurricanes Katrina, Sandy, and Ike, the tornados in Lady Lake, FL and Birmingham, AL, and the earthquake in Haiti. Aaron has also worked in remote clinics in Papua New Guinea, Mexico, Guatemala, Honduras, Nicaragua, Venezuela, and Haiti. Aaron owns Four Corners Specialty Rescue, a WMTC Licensed Provider. An avid climber, skier, mountaineer, boater and adventurer, Alison is currently a lead instructor for the Northwest Outward Bound School. Previously she was a Biological Science Technician and Wildland Firefighter at Glacier National Park, where she was involved with several large-scale Search and Rescue missions. A climber, mountaineer, and rafter, Rachel works for the Northwest Outward Bound School and Prescott College. In a past life she worked for residential youth-at-risk programs with outdoor programs. A climber, skier, canyoneer, and paddler with numerous first ascents and descents in his resume, Paul now spends too much of his time in the WMTC office in front of a computer. In addition to managing WMTC's office, curriculum, and publications, Paul works part-time as an outdoor program risk management consultant and is a member of the Wilderness Medicine Education Collaborative (WMEC) who wrote the WFA, WAFA, and WFR Scope of Practice documents. A climber, skier, whitewater kayaker, and backpacker, Patrick is a paramedic instructor for the state of New Mexico and works part-time as a DJ. Patrick worked and taught for the Santa Fe County Fire Department, as pro ski patrol, and as a medic in an urgent care clinic. Patrick owns Outside Medicine, a WMTC Licensed Provider. A backpacker, skier, climber and paddler, Taito owns Backcountry Classroom Inc. where he provides outdoor leadership program to companies, professional sports teams and communities. Backcountry Classroom is a Licensed WMTC Provider. Taito holds Wilderness Education Association Certifying Examiner and Leave No Trace Master Educator, established Wilderness Education Association Japan and directs Camp Hanayama sponsored by Yoshonen Camp Society. A climber, skier, paddler, and backpacker. In a past life, he was an Army medic in the Middle East, a boy scout, and ex-director of the New England YMCA outdoor programs. Derek owns Feral Medicine, a WMTC Licensed Provider. A climber, mountaineer, and sea kayaker, Joel works for the Northwest Outward Bound School as an instructor, staff trainer, and course director when he's not working for WMTC, COE, or on his own expeditions. Joel owns Cascade Outdoor Education, a Licensed WMTC Provider. A climber, skier, and paddler, Drew is an ex-WMTC and -Outward Bound instructor; he now spends his time working in the hospital and outside playing with his family. A climber, mountaineer, skier, canyoneer, and paddler, Josh is the director of the Wilderness Leadership and Experiential Education associate degree program at Mount Hood Community College; Mt Hood CC is an WMTC Affiliate Provider. A backpacker, climber, canyoneer, and ex-NOLS instructor, Tiana prefers to spend her spare time exploring little know and remote waterways in her pack raft. Her personal adventures have taken her all over the US from Maine to Washington and internationally to India, Canada, Mexico, Nepal, Thailand, Vietnam, Costa Rica, and China. Tiana currently heads the outdoor program for Westminster College; Westminster College is an WMTC Affiliate Provider. A PADI Master Scuba Diver, certified in Open Water, Advanced Open Water, Night Diving, Deep Diving, Underwater Navigation, Underwater Naturalist, Equipment Specialist, and Rescue Diver and past canoeing and sailing instructor, Kerry's full time work is as an Assistant Professor of Emergency Medicine at the Texas A & M Health Science Center College of Medicine, teaching pediatric and emergency medicine residents the art and science of the acute care of children. In her spare time, she plays outside with her family and leads Girl Scout backpacking trips.